Image 1. 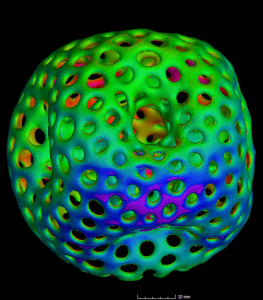 (Left) Meltpool monitoring volume image of additively manufactured metal organic sphere with a high degree of porosity and (right) a CT scan of the same object. The first technology predicts flaws based on real-time in-situ measurements taken during an AM build; the second examines finished products for integrity. Sintavia and Concept Laser collaborated on a study of the correlation between the two quality-assurance methodologies. “I think the news about the GE Leap engine fuel nozzle really resonated throughout industry,” says Doug Hedges, president and COO of Sintavia LLC, a metal AM service provider for aerospace, defense and other industries. “That got everyone’s attention and certainly increased the pace of inquiries for us.” The nozzle, produced internally at GE, was the first 3D-printed part certified by the U.S. Federal Aviation Administration (FAA) to fly inside a commercial jet engine. Brian Neff, Sintavia CEO, had already founded Sintavia (a combination of “sintering” and “aviation”) in Davie, Florida in 2012, the year before the GE milestone announcement. Informed by his and Hedges mutual aerospace backgrounds, they’d had an eye on AM for quite some time. “Additive manufacturing is a very challenging field,” says Hedges. “We felt we needed to enter it in the early stages—rather than wait until the industry was more mature—in order to refine our skills.” Their AM resources now include five machines from three of the leading metal manufacturers as well as an electron beam melting (EBM) system—and they are finalizing plans for a new facility, over five times the size of the current 10,000-square-foot building, to open in mid-2018. Image 2. Sintavia applications engineer Shawn Morgan (left) and additive technician Juan Manjarres (right), work with one of the metal additive manufacturing company’s newest machines, an M2 cusing from Concept Laser. As their business accelerates, Sintavia’s AM expertise continues to deepen, along with a profound understanding of the unique complexity of the technology. The “wishbone” roadmap, known in the industry as the Ishikawa diagram of process parameters for AM, continues to guide their inquiries into the many variances that could potentially affect part quality. Image 3. The Ishigawa diagram of process parameters for additive manufacturing. There is growing demand for this kind of attention to detail across industries either engaged in, or wanting to become involved with, additive manufacturing, says Hedges. 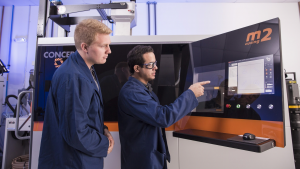 “At this point in time the most pressing needs for additive manufacturing are industry standards that incorporate ASTM, AMS, implementation into the MMPDS, material and process specifications, data collection and access, post processing, fatigue assessments and standards that include actual CT scanning instead of film. Image 4. 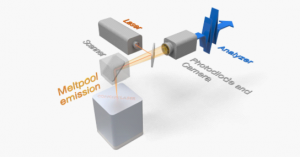 Graphic of the Concept Laser QM Meltpool 3D system. Image 5. 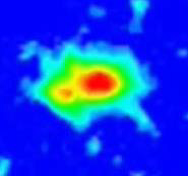 Infrared camera image of an AM meltpool as the laser melts powdered metal. The data continually runs through software that calculates the average emitted meltpool intensity and area per build layer, providing a moment-by-moment, high-resolution visual prediction of the process. 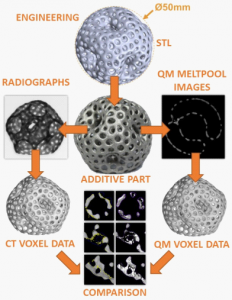 Volume Graphics’ data analysis and visual analysis software then combines the input from multiple laser passes into a voxel image of the part and its internal structure. This gives the operator a continuous, three-dimensional view of the growing part and enables them to detect any potential for irregularities in the build as it progresses. Sintavia in turn wanted to strengthen their quality-assurance capabilities by exploring the value of meltpool monitoring and CT in tandem, says Hedges. “CT is a natural extension of the technical expertise in metallurgy and metrology that we think is extremely important to the future of AM.” The Concept Laser M2 cusing and the Nikon CT scanner share the same software, an advantage that helps avoid any interoperability issues. 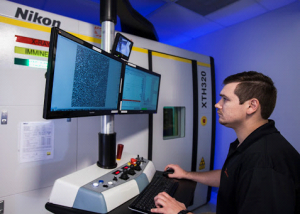 CT scanning—a valuable tool for assessing traditionally manufactured products in certain industries—is already a requirement for most critical parts, Hedges points out. “It’s a great tool that allows you to see both internal and external geometries, detect voids, confirm densities and then perform extremely high-value metrology for first-article dimensional inspection,” he says. Image 6. Sintavia lead engineer Pavlo Earle with the company’s CT scanner. “Starting this project, the fundamental questions we wanted to answer were, ‘Is data from in-situ monitoring similar to a CT scan and, if so, can it be used to qualify parts?’” says Earle. Image 7. 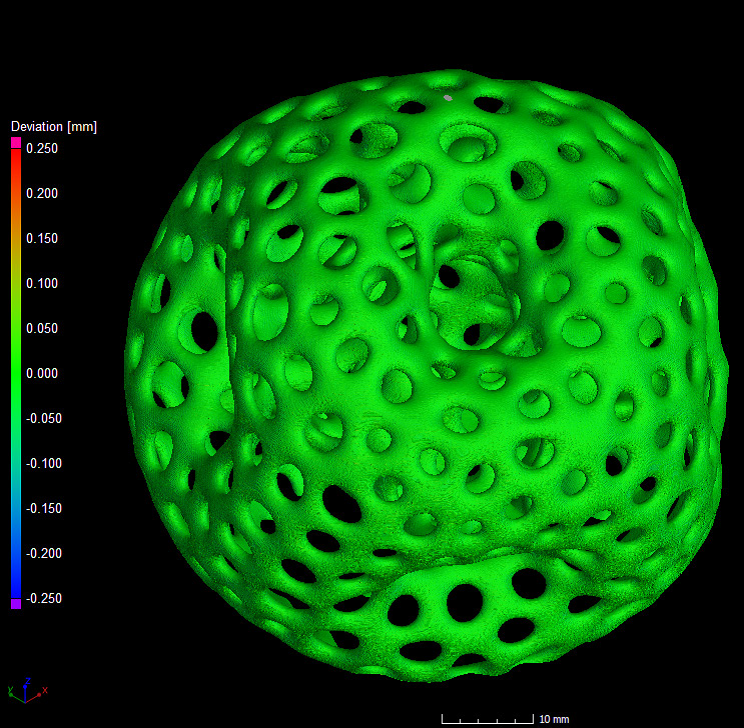 Workflow of the test of one of the shapes (organic sphere) in the Sintavia/Concept Laser project. Center top two images are the CAD design of the sphere with defects, and the finished product. Down the right side are the QM Meltpool 3D images, down the left are the CT scan results. Bottom six figures demonstrate the correlation between defects predicted, and then identified, by the two technologies.